The project went into administration last year, unable to secure the financing needed to go racing - even though the vehicle was all but built. Engineers are looking to start high-speed trials "as soon as possible". "My kids kept saying I should buy a fast car, so I bought the fastest," he joked. "I knew that I could buy the car, save it and put it in a museum. But once I'd bought it we looked into whether we could run it, whether we could resurrect it as effectively a new project. "It is commercially viable. We believe the value of the sponsorship will easily pay for the project," he told BBC News. Casual observers may not notice much of a difference. Yes, the car has a new white and red livery but it's exactly the same vehicle that made its inaugural slow-speed (200mph/320km/h) runs at Newquay airport in October 2017. 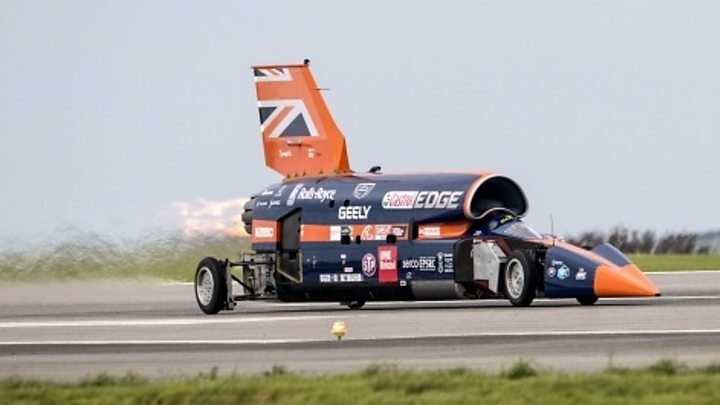 It will still be powered by a Rolls-Royce EJ200 jet engine and a Nammo rocket, and RAF man Andy Green (the current land speed record holder - 763mph/1,228km/h) will do the driving. People might notice that the patchwork of sponsors' logos has gone. Previous statements of support were all contracted through the old holding company, Bloodhound Programme Ltd, which no longer exists. The new legal entity is Grafton LSR Ltd, which has Mr Warhurst as its CEO. The HQ has moved. It's no longer in the Bristol suburb of Avonmouth and has shifted along the Severn Estuary to the university technical centre in the Gloucestershire town of Berkeley. What fans really want to hear, however, is that the financial underpinning of the project has changed. 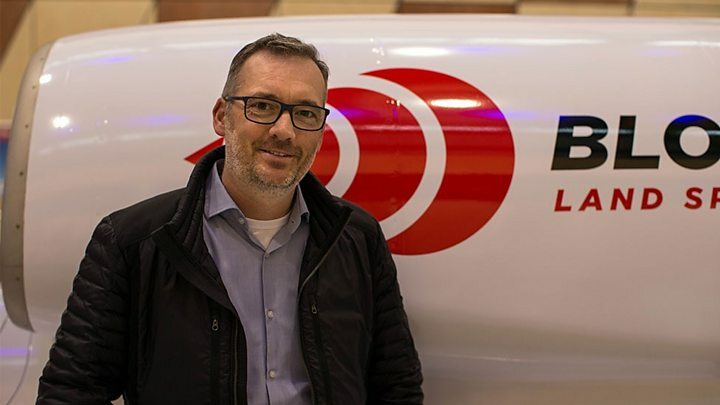 It's understood Bloodhound will still pursue a sponsorship and partnership model, but Mr Warhurst will act as a kind of guarantor, ready to step in if cashflow faces a bottleneck. Depending how successful the project is in raising funds, the Barnsley entrepreneur, who made his money in turbochargers, could be putting his hand deep into his pocket, or not much at all. But that "safety net" was never there in the past, which meant that when cash coming into the project slowed, it would often be forced into hibernation. Momentum was lost. There is another key departure from the past approach. Sponsorship opportunities now include the project title and the car's livery. Bloodhound may not stay white and red for long. Media captionMark Chapman: "The ambition is to start running as soon as possible - but only when we're ready"
As it was - very nearly complete, certainly in the guise required to begin high-speed trials, which would take the car into the 500-600mph region. That's the realm where airflows get interesting and the team can learn about the vehicle's handling and how to operate it when an attempt is made to go through the sound barrier and on to 800mph+. There's some electronics work to do, the brakes need to be switched from carbon to steel, the parachutes to slow the car have to be installed, and the near-200 sensors across Bloodhound must be hooked up. "It sounds daft but the longest items are going to be the paperwork," said Mr Chapman. "All our assets are now owned by Grafton and the switch comes with a lot of bureaucracy that needs to be gone through if we're to take things like an EJ200 to South Africa. We'd like to get there before this year's weather window closes, but if we can't - so be it. We'll only announce a date when we know we can hit it." The project will move forward in two phases. The first is simply to try to break the land speed record set by Andy Green in Thrust SSC way back in 1997 - the first and only time a car has been taken through the sound barrier. In the past, Bloodhound has always been spoken about as a 1,000mph vehicle - and its engineers firmly believe it can really go that fast. But to achieve this phase two goal, modifications would be required at the rear of the vehicle to improve the aerodynamics and to make room for the most powerful version of Nammo's rocket technology. 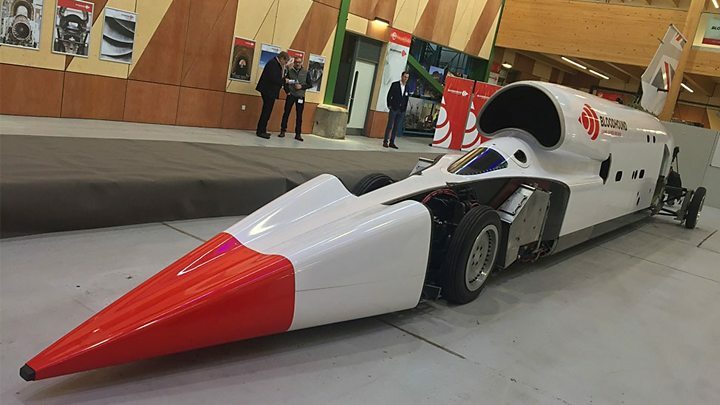 "We are in a fantastic position with a mostly finished car which has already proved its basic performance with the runs it had at Newquay," Wing Commander Andy Green told BBC News. "We're still trying to achieve an astonishing global engineering adventure by getting the most advanced, straight-line racing car in history to a new land speed record. But Ian, sensibly, has said 'let's make this as manageable as possible by doing it in two bites'."